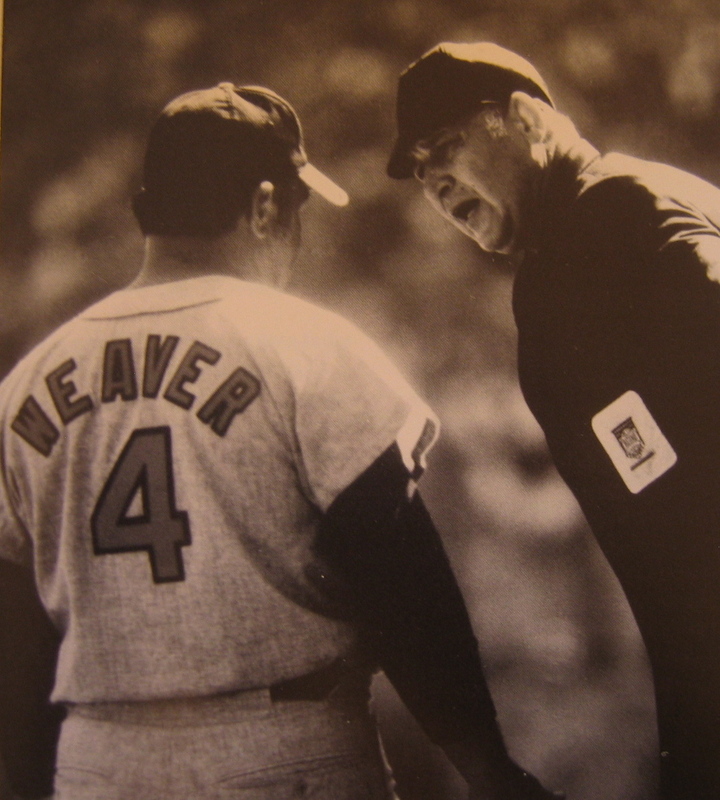 • There are several good shots of the Angels’ old halo-clad headwear — caps, helmet, and helmet again (note the ump’s necktie, too). • The felt lettering on this jersey looks so thick, I want to reach out and touch it. 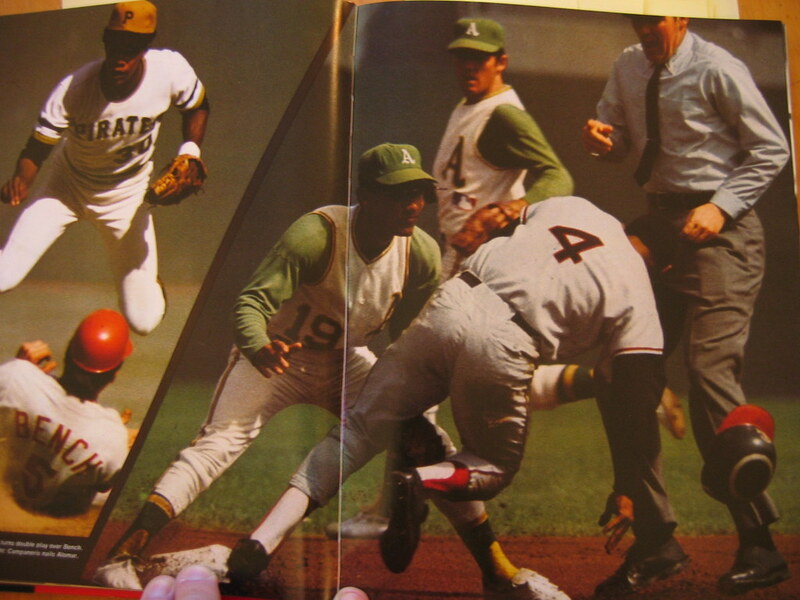 • Odd sight here: Looks like Willie Mays is wearing a short-sleeved windbreaker under his jersey, instead of the more common long-sleeved model. 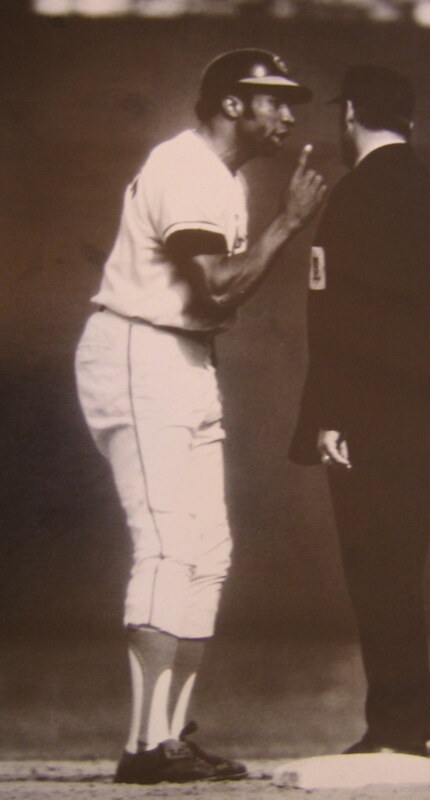 • Here’s another shot of Frank Robinson and his customized stirrups, with an extra strip of fabric added on the bottom so the stirrups can be pulled up higher. • Never thought I’d see Junior Gilliam, of all people, wearing backwards stirrups. 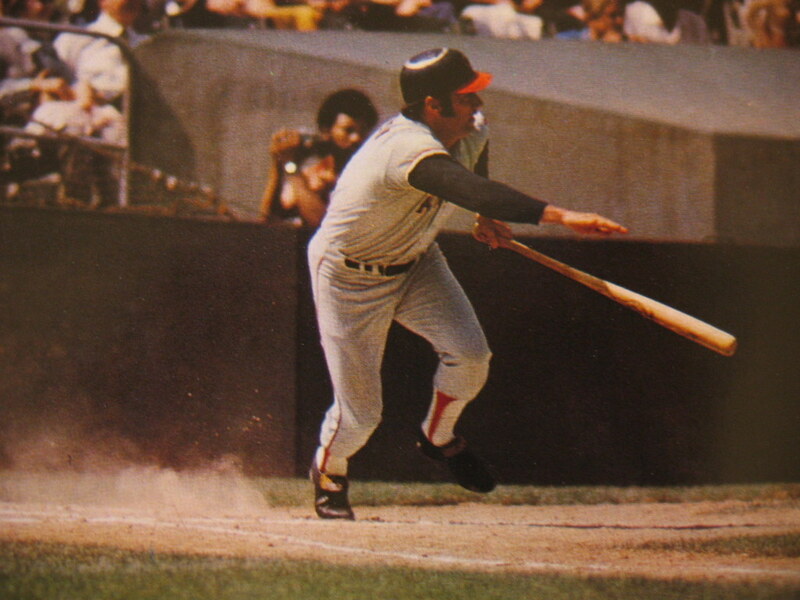 • You might think I’m including this photo because of the striped stirrups. And yeah, they look hot. But the real point here, at least for me, is that the 1960s Chisox wore uni numbers on their right sleeves on the road — something you wouldn’t know from Dressed to the Nines, because right sleeves aren’t visible. 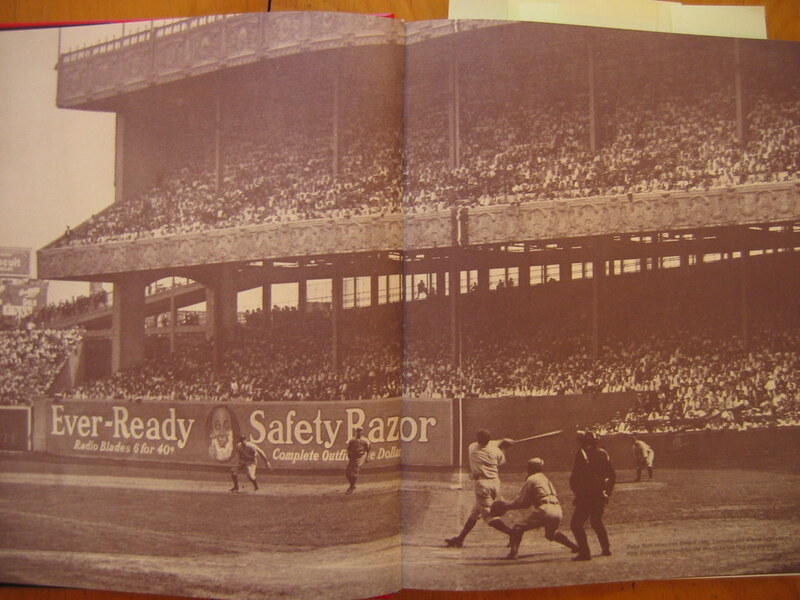 • The book also includes some older photos, including a pair of New York oddities from 1916: the Dodgers’ tattersalls and the Giants’ plaids. • Here’s an old shot of the Polo Grounds. Check out those stripes between the mound and the plate! So many fungo circles (or at least that’s what I’m assuming they are) around the plate, too. Anyone know more about either of these details? 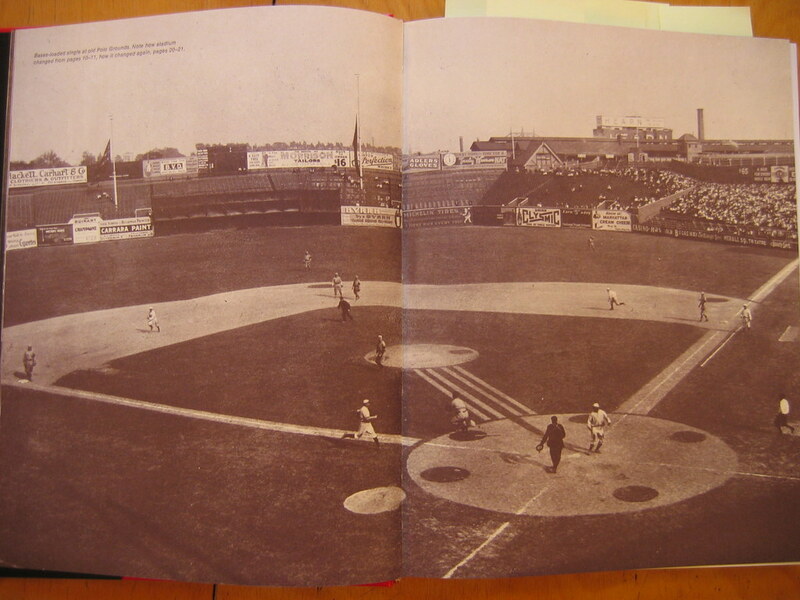 • This is also the Polo Grounds, albeit a bit later. The Yankees played there before Yankee Stadium was built. That’s Babe Ruth, in the pre-uni number era, launching one. Want your own copy of this book? You can get one for almost nothing. We’ve occasionally touched up on this topic here at Uni Watch (the little pitchforks used on the field at Sun Devil Stadium, e.g., or the “410” marker at Shea Stadium being changed from white to black during the mid-1980s after Keith Hernandez complained that the white numerals were distracting him at the plate), but I’m not aware of anyone whose compiled a database of stadium or on-field typography. If you know of such a repository, and/or if you’d like to contribute some particularly interesting visuals (no obvious stuff, please), you know what to do. • First, go to this link. You’ll see the Riversharks’ June schedule. 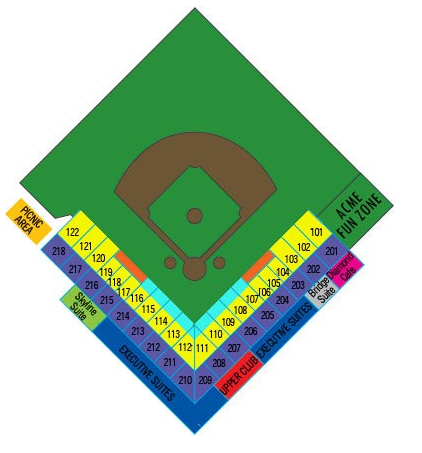 Click on the June 5th game, and then click on “Let me pick my seats from a seating chart.” You should then see a diagram of the Sharks’ stadium. • See the teal seats right behind home plate, and the yellow seats extending down the baselines? All of those seats are available for the $8 price. Just click on the section you want and choose your tickets from the resulting “Eligible for Stirrups” seat listing. • When you select your seats and click “Add to Cart,” the screen will initially show the regular ticket price. But when checking out, enter the promotional code “stirrups” in the appropriate field, and you’ll get the special $8 Uni Watch price. There had initially been talk of a pregame Uni Watch party, but lots of people told me they wouldn’t be able to make it to the ballpark early enough for that (plus I’m gonna be busy beforehand getting ready for the first pitch, showing the players the right way to wear stirrups, etc. ), so we’ve scrapped that idea. But I’ll make a few rounds through the stands to meet up with readers, OK? 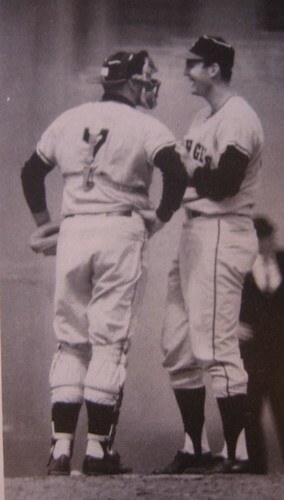 OK.
Wasn’t sure when White Sox added number to right sleeve, but know they had them in ’59 World Series. Did quick browse through cards for sale on ebay. Here’s a fifth series ’58 Topps. None of earlier ’58 White Sox cards show number on sleeve, so looks like that was the year they first appeared. Note: For good look at those home unis, check 1960 Topps. For some reason, Topps had card photos taken during ’59 at Comiskey (prior to Giants/Dodgers move, almost everything was shot in New York or in spring training). I think of the ’60 cards of the Barry Latman and Nellie Fox in particular. Great look at Indians pins on Russ Nixon’s card that year, too (a spring training shot). Whoa, forgot how large stadium is on ’60 Russ Nixon. Doesn’t look like spring training after all. Here you go, save u the trouble of searching. is romano just happy to see buzhardt? Don’t know if that’s standard now or not. Perfect day to pick too, Paul, as it will be the nightcap of a Phillies Business-Person’s Special/Camden Riversharks doubleheader! Man, Paul, I’m bummed. I live in Philadelphia, but my brother’s high school graduation is on Thursday night. Do you think I can wear striped stirrups to that? By the way, just so you know, that field where the Riversharks play is absolutely beautiful, practically under the gorgeously lit Ben Franklin Bridge. Or he fell asleep on a McDonalds sign? One of the great things about the Uni Watch Book Club is that most of the recommended books can be found on amazon.com for pennies, plus $3.99 shipping. What a bargain. The catalog is superb. Of course. But I have an important question about it: What two football teams are depicted on the cover? I think the Braves regular hat with the Red Brim and button looked awesome with the alternate SOLID BLUE top!!! I’d say purple team is either Northwestern or Texas Christian…they had almost identical unis about that time. Opponent could be Indiana (if NW) or Texas A&M (if TCU). Again, saying “could be”. Is tough cuz white helmets so blurry, and accent color could be distorted. Think might be older that previous year, which would have been ’61, or course. Has the look of generic “football” stock photo. OK, so how many people are going to foolishly keep trying to sue ballparks/teams/equip. manufacturers when they get hit by broken bats and balls, even though not one of those lawsuits has ever been successful and have pretty much been declared dead in the water due to all the precedent? Unreal. If photo goes back to late 50s, white team could be Wisconsin, before they added the huge red “W” front and center on the helmet. Sorry, which photo is that? Though I agree that these claims are bogus, not all of them fail. Negligence laws vary from state to state. It may have been in Florida that someone sued for such an injury and won a tidy sum of money. 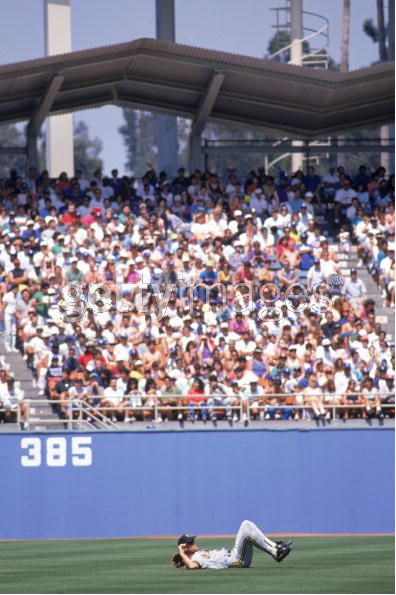 I am also reminded of the drunk girl who sat on an upper deck railing to be photographed after the first regular season game at the Ballpark in Arlington back in 1994. She fell into the seats below, suffering some injuries but fortunately surviving. The team paid a hefty settlement and increased the height of the railings to further discourage drunks from taking the plunge. Whoops – see it now. Don’t think it could be Wisconsin – before the excellent “W” helmets, they wore white shells with a red stripe. 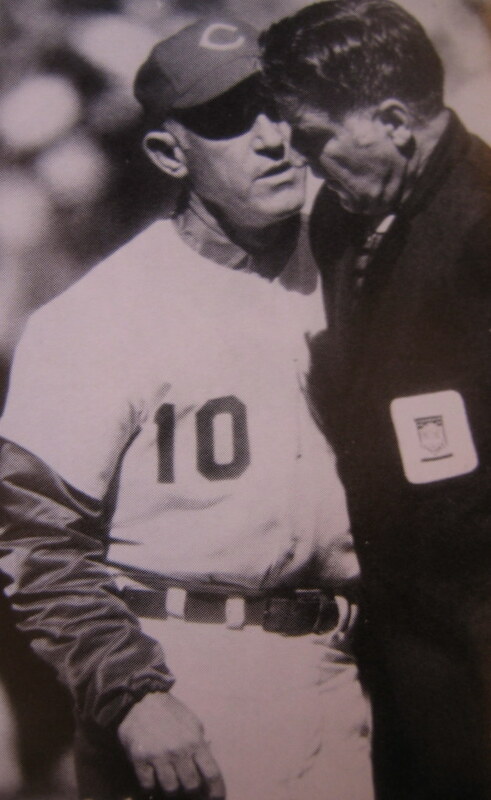 They didn’t go all-white until 1966, and even then they wore red numbers on the sides. Because people don’t grasp the implied consent by going to the game. what’s that “aggressive award” helmet (1969)??? anyone with more details? did they wear that on the field…and if so, did only those who received said agressive award wear them? and what exactly was the criterion (or criteria) to receive such a colorfully named prize? So maybe IS Indiana? Good bet most stock photos where shot in and around major markets back then, so would make Northwestern a more likely site than TCU. My monitor just isn’t giving me a good look at white team helmets at all. Although I suppose could be some non-conference opponent, too…Washington State or someone (that’s without checking NW’s home schedule those years, of course). Well, in 1916 a great white swam a number of miles inland up Matawan Creek, New Jersey with nasty results. This was part of a wave of Jersey shark attacks that inspired Spielberg’s Jaws. Camden, of course, is on the other side of the state on the Delaware River, so their name is a bit of a stretch if this incident is what they’re alluding to. I doubt it’s that they don’t grasp it. I think it’s more likely that they don’t know it exists. For instance, that woman that just recently got nailed said she wasn’t a baseball fan and got the tickets from a friend, so she probably had no idea. Plus, like someone else said earlier, laws can vary from state to state, so it’s worth a shot. If I, for one, got nailed by a broken maple bat and had ridiculous medical bills to deal with and probably got free representation from a lawyer who was looking to make his career-case, why not? It’s worth a shot. Not to mention that if the bat broke because of some kind of faulty maniufacturing process or quanity control, then she might get a payout from them. It’s not that cut and dry. 1. Everyone needs to lay off Bryan…Enough already! 2. 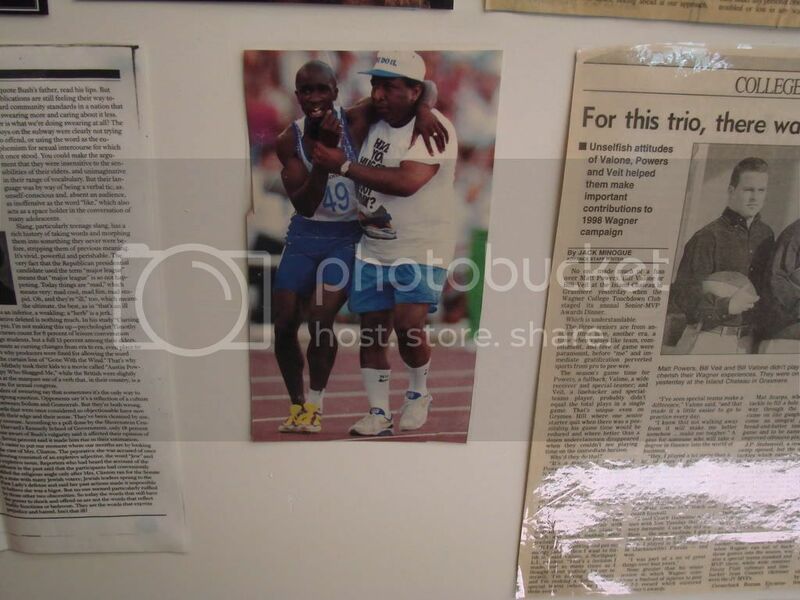 The discussion involving the Derek Redmond Olympic race and it’s use in a Visa commercial was very interesting. I remember watching the race live and thinking it was one of the most poignant thinks I had ever seen. Luckily SI had a large picture of it in the next weeks issue that I was compelled to cut out and still have today, laminated and posted in my classroom! By the way, the sneaks on Mr. Remond’s shirt were the original Nike Air Huarache, an alltime favorite of mine! Oh, and another reminder…leave Bryan alone! We can disagree with his views or style or both, but lets not be malicious. As I, and many others have said before, we are all here for the SAME REASON! Anyone see Manny’s LMontro.com shirt with “Got 500?” on it that he was wearing on Saturday night? LMontro is the unofficial team barber for the Red Sox. Wow, great seeing “This Great Game” featured! I got it when it first came out, when I was 15, and just about wore it to tatters. The ad on Mr. Redmonds shirt reads “Have you hugged your foot today”? Don’t let Paul go near these pages. The purple runneth over. The pic in the book was color and primo. But what’s up with those? This is why I come to UW every day! I will not sleep until we have an authoritative answer. Picture from one of those base ball games played here in Milwaukee recently. Apparently period specific attire stops at the ankles. Like I said – the pic in the book was MUCH better and easier to see the look of them. 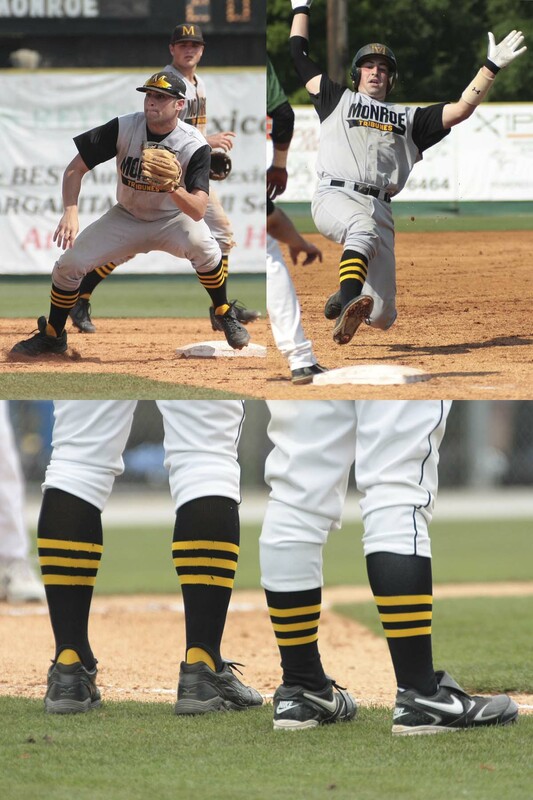 But they just don’t look like stirrups. They appear way too thick. Pulled that high they should be really thin and laying much closer to the leg. Back then there were some really thick all-stirrups socks available (they were among the first all-stirrups avail to public). 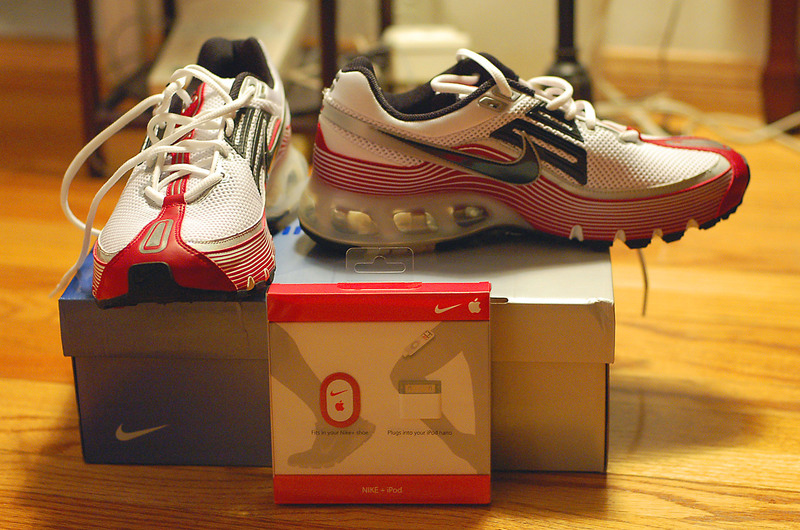 I must have half a dozen pair in different colors…all bought about that time. [quote comment=”273767″]Picture from one of those base ball games played here in Milwaukee recently. Apparently period specific attire stops at the ankles. LOL, I remember having them pulled so tight that, standing out in the field when a strong wind came up, sometimes the damn things would actually vibrate and “buzz”. 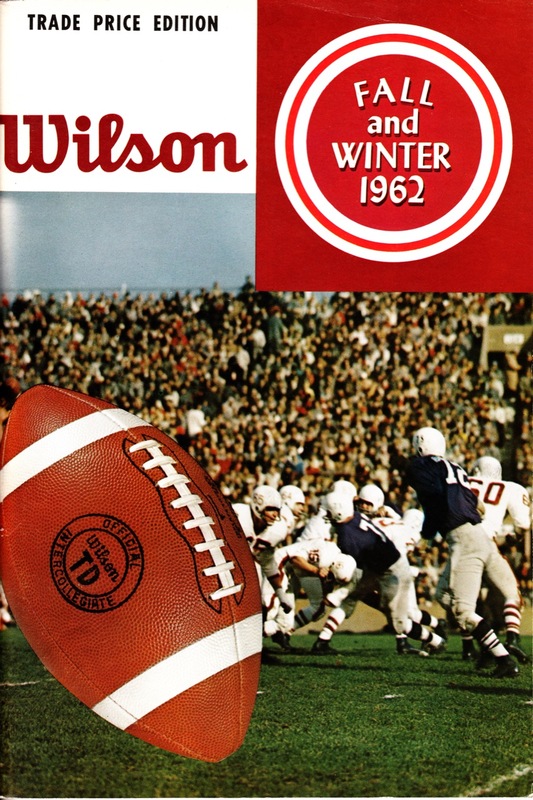 October 31, 1959…Northwestern beat visiting Indiana 30-13. Bull sharks have been seen outside of St. Louis, MO…that is remarkable. The Nike Vapors aren’t just a carbon fiber color. Practically the whole shoe is made of carbon fiber. Those are a limited edition boot that cost a meager $400. They weigh like 6 ounces. The green ones are a super light synthetic leather that weighs around 7 ounces. I’m fairly certain the team in purple (which actually looks more navy to me) is not TCU. I’m not an expert in TCU football, although since I’m an alum, maybe I should be. I am assuming that by wearing colored unis, the team in purple is the home team. My theory that this isn’t TCU comes mainly from the depictions of the stadium. The Amon Carter Stadium field runs north-south, meaning the shadows go sideline-to-sideline throughout the day, not endzone-to-endzone, as the shadows on the field suggest. Also, Amon Carter Stadium has double deck stands on the west side and single deck stands on the east side. Currently, there is a high concrete wall behind the top rows on the single-deck side. The photo shows the top row against a short fence that would make the stadium grounds visible from the top row, which is not the case at Amon Carter. That’s my contribution…good luck finding the correct answer! In 1969, Badgers coaches would give out what they called the “Savage Award” to the player deemed most agressive after every game. That player would wear a black helmet (as opposed to the regular cardinal) for the rest of the season. i was actually more interested in what constituted ‘savage’ play…dirty play? overly-aggressive? like…if you broke the opposing QB’s leg did you win the award? I remember that. Also remember being at a Gopher game when a Wisconson DB wearing a black helmet injured a leg, and lay in the back of the end zone for what seemed like forever. He eventually had the leg amputated. Be damned if I can remember his name. “Mel” someone, maybe? Frankly, I often wondered if Gopher players didn’t target the guy cuz of the black helmet and “savage” label. I say that because after the incident almost nothing was written or said about it, almost as if it had never happened. And Wisconsin never did the black helmet thing again. Compression, Tension and Torsion: The tenets of 8th Grade Technology Education and thusly my career! [quote comment=”273781″]Frankly, I often wondered if Gopher players didn’t target the guy cuz of the black helmet and “savage” label. I say that because after the incident almost nothing was written or said about it, almost as if it had never happened. Well, they also didn’t do the cardinal helmet thing again, either. So be careful about reading too much into it. Hadn’t heard about that incident, but I’ll look into it – sounds fascinating. My college coaches gave out awards on the Monday following both the Saturday vasrity game as well as the Sunday Junior Varsity game. The offensive and defensive players of the games were awarded RB awards referring to our legendary equipment manager, Joe Jilts, who called everone, including his grandmother, rat bastards. The hardest hit of the game was awarded a bronze hammer with a green painted handle. This was in reference to our head coach, Walt Hameline, who was nicknamed the “Hammer” and would frequently implored us to be the hammer as opposedand not the nail! This was in reference to our head coach, Walt Hameline, who was nicknamed the “Hammer” and would frequently implore us to be the hammer as opposed to the nail! I am a one-and-done not-so-charter member of the Marriott rewards club. Anyone else have a disappointing experience there? I will be staying elsewhere for my next foray into Boston. What IS the Official Hotel Chain of the Boston Red Sox, anyway? Anyone? Even though I love me some Rafa (he is so hot for a child, and no, Original Jim, he is not “greasy”; he just is wearing too much hair gunk), I don’t like the neon balls of flame. 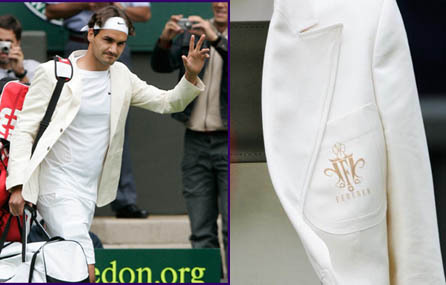 I much prefer the elegant smoking jacket and understated shoes of Roger Federererer’s Wimbledon wins. Then again, the contrasting ‘uniforms’ really highlight the differences between Roger’s and Rafa’s personalities. I wouldn’t mind Rafa’s ensemble so much if it was in, say, black or red–I just don’t like neons. As for the bat/suing thing (Matsui? ), I agree with Duckstyle that if the bats were made improperly, then she might have a case–and that’s coming from someone who thinks there’s entirely too much suing going on in this country. 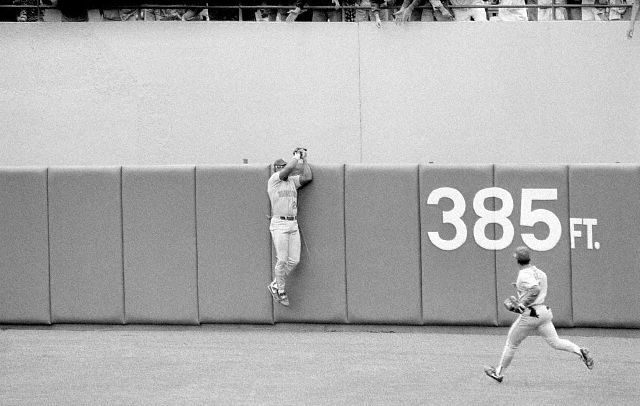 I don’t think anyone hit with a ball should sue, though, because that truly is a risk inherent to the game. I play on a vintage base ball team here in Michigan, and we tell our players to black out any modern logos and non-black elements on their shoes. Apparently the Milwaukee Cream Cities don’t do the same thing. Of course, I don’t have to worry about that, because I don’t wear shoes when I play. [quote comment=”273783″][quote comment=”273781″]Frankly, I often wondered if Gopher players didn’t target the guy cuz of the black helmet and “savage” label. I say that because after the incident almost nothing was written or said about it, almost as if it had never happened. Yup, just said I “wondered”, cuz at start of game was thinking that black helmet tended to make it’s wearer a target. Remember thinking, “Black helmet in practice, maybe, but in game sure does single out a guy.” Less that two hours later he was prone, unmoving and about to lose a leg. 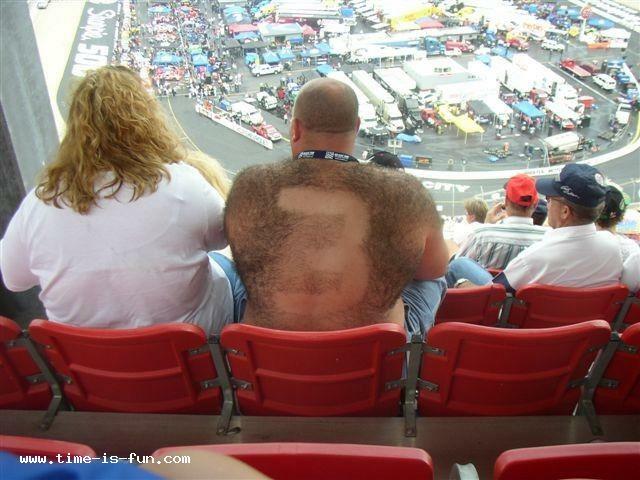 My point was I wondered if the coaching staff figured out what I saw just sitting in the stands. “Y’know, maybe we shouldn’t make one of our better players a bullseye.” Ya think, coach? A pox on all of them, I say. The Gwinnett Braves unveiled their new look today. They’ll be the new AAA affiliate of the Atlanta Braves, relocating from Richmond. 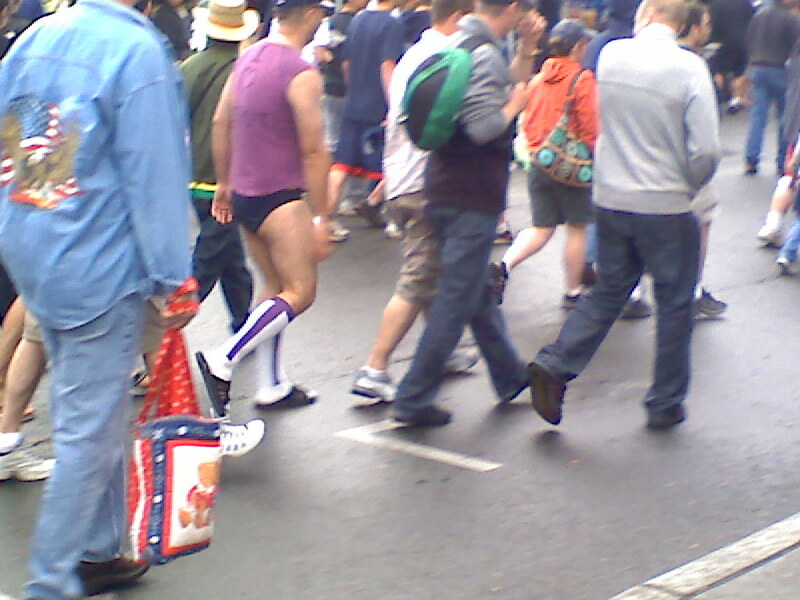 There were “stirrups” at the time that really weren’t stirrups in the traditional sense. They were t-shaped strips of elasticized polyester. 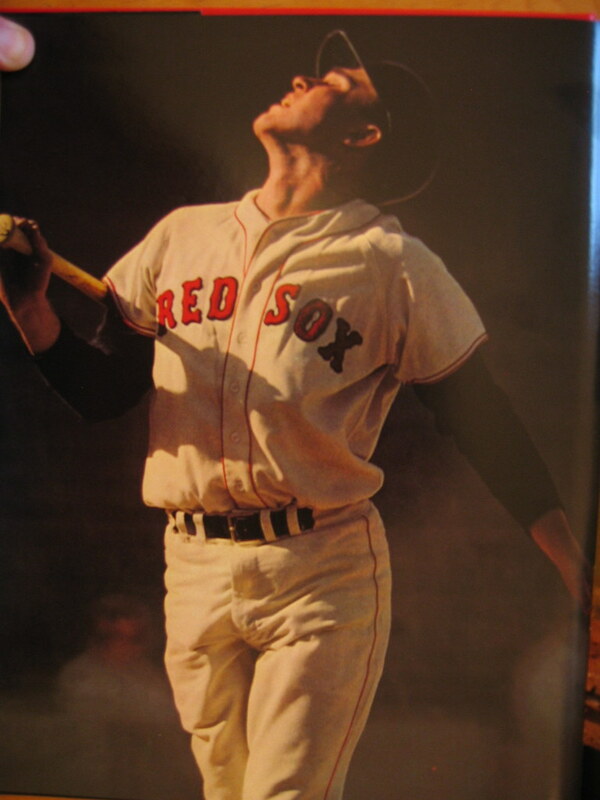 They would look like Yaz’s stirrups, even if they weren’t pulled tight. They usually did not hug the leg, instead leaving a sizable gap between the stirrup and the leg. [quote comment=”273790″]The Gwinnett Braves unveiled their new look today. They’ll be the new AAA affiliate of the Atlanta Braves, relocating from Richmond. Ugh, I hate it when minor league teams follow along with the same nickname. The minor league team can create such a unique identity with their own name (Lookouts, Hammerheads, Isotopes, Biscuits), instead of just going the cookie cutter route. I’m sure it’s Atlanta that wants everything to be Braves, but I’d much rather see some originality. Over the weekend I was flipping through the channels and came upon uni gold. Here in St. Louis a bunch of amateur guys played the longest game ever. One team wore St. Louis Browns unis and the other wore St.Louis Stars. I love everything about that Browns uniform. [quote comment=”273788″]”Black helmet in practice, maybe, but in game sure does single out a guy.” Less that two hours later he was prone, unmoving and about to lose a leg. [quote comment=”273792″][quote comment=”273790″]The Gwinnett Braves unveiled their new look today. They’ll be the new AAA affiliate of the Atlanta Braves, relocating from Richmond. YEah, but I argue that minor teams have really crappy names. Not saying all Pro teams have great names either (Thrashers, Rays, Jazz) but minor league teams seem to have really cheesy names. Unfortunately, we seem to be seeing somewhat of a trend in the return to the days of affiliates being named after their parent teams. Last year, Scranton Wilkes-Barre dropped its Red Barons nickname for the Yankees, and supposedly next year the Salem Avalanche will give up that name to become the Salem Red Sox. I guess the MLB teams see an opportunity to make even more money after their brands at the minor league level. I’ve been lazy away from the computer for a day or two, but the Mariners wore their “Marineros” jerseys in honor of Latin American beisbol. 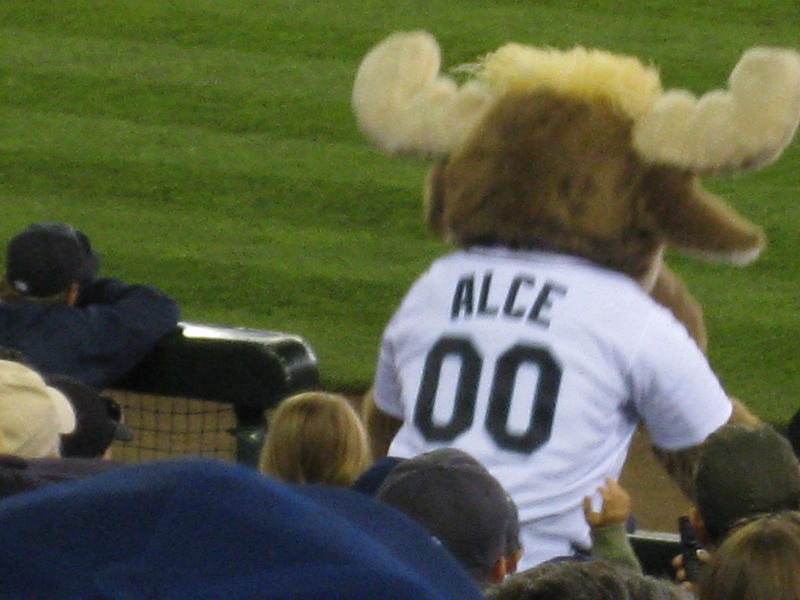 Even the Moose got involved. And why aren’t the tag buttons showing up when I post? I’m having to remember basic HTML coding! totally non-Uni related, but I wanted to share this. I received an e-mail from the Detroit Tigers encouraging me to vote 25 times for Ivan Rodriguez to be the AL all-star catcher; not only that, the message implored me to get friends to do it, too. That is so disingenuous! Shouldn’t the starter be elected based on his on-field performance? I wonder if other teams are doing it, too? [quote comment=”273798″]I’ve been lazy away from the computer for a day or two, but the Mariners wore their “Marineros” jerseys in honor of Latin American beisbol. Pat Lagreid, it has to do with the glitches the site has been having lately. If you look right under the ‘leave a comment’ phrase, though, there in tiny script (which I just saw today) are the short-hand codes. RaoulDuke, that game is the coolest thing I’ve seen today. I wish I could have been there for all thirty-two hours! Re: affiliate team names: I prefer that they come up with something wacky and off-beat rather than just mimic the parent teams. I like a little spice in my life, and affiliate teams should reflect the local flavor/color. Here is the entire article, but I wish they had more pictures. [quote comment=”273801″][quote comment=”273798″]I’ve been lazy away from the computer for a day or two, but the Mariners wore their “Marineros” jerseys in honor of Latin American beisbol. I agree. It would be pretty crappy if the Nashville Sounds had to take over the name of their parent club. In my lifetime, the team would have been called the Nashville Yankees/Tigers/Reds/White Sox/Pirates/Brewers! Actually the Braves where voted “America’s Team” during the 90’s but don’t refer to themselves as that anymore and haven’t for years. 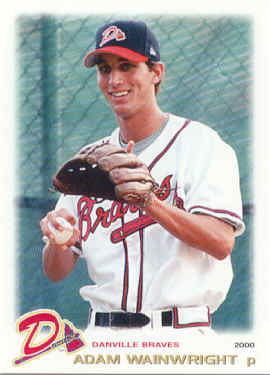 The Braves do have one team, Myrtle Beach Pelicans, that don’t use the Braves as a nickname. I think the Rays has some of the best minor league names with Bulls, Biscuits, Catfish, and Renegades to go along with a few Devil Rays names. Ricko1, really? I thought the Cowboys were “America’s Team”. I like the New Britain Rock Cats! That has personality. Wade Harder, wow! Why did they switch so much? Just think, if you were to buy a t-shirt/ jersey for each change of parent team, you would be out a pretty penny. Of coure, the idea DID start with the Cowboys…even BEFORE Jerry Jones owned them…so I guess we can understand the thinking. We always used the say the real America’s Team was whoever’s playing the Cowboys this week. Forgot about Elizabethton. Point was the Twins, for one, have never been big on using their nickname organization-wide. Actually, other than the Braves, which teams DO use the big club’s moniker so extenstively? (That’s not a challenge; I just don’t recall offhand). I’ve seen NFL teams put their quarterbacks in red practice jerseys, signifying “hands off” (no tackling, dummy). I’ve seen red mesh pullover vests OVER a white practice jersey. Ricko1, I wasn’t trying to contradict ya–I was just excited to see the cool names of the double A teams. Are you from the Twin Cities by any chance? In other news, Babe Ruth’s granddaughter wants Major League Baseball to retire Babe’s #3 throughout both leagues. Sorry. Don’t think so. You can make a case for several of the giants of the game (not New York Giants). 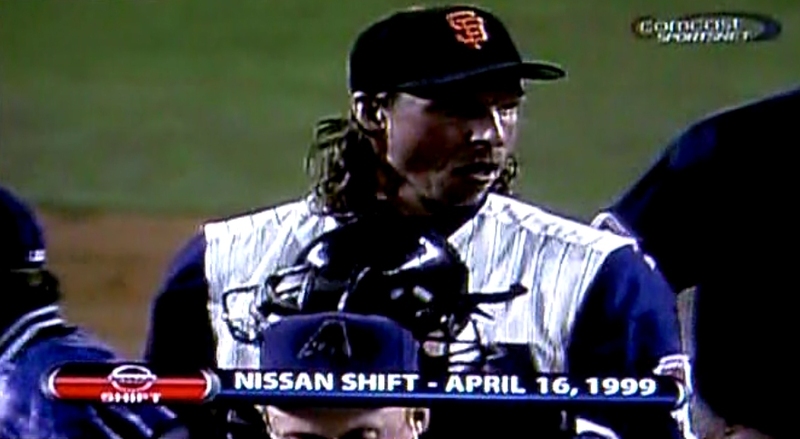 It was an overreaction when MLB retired #42 in 1997 (well-intentioned as it was, it was still an overreaction, and they keep overreacting to this day) and retiring more numbers throughout the game makes it less special. [quote comment=”273813″]In other news, Babe Ruth’s granddaughter wants Major League Baseball to retire Babe’s #3 throughout both leagues. 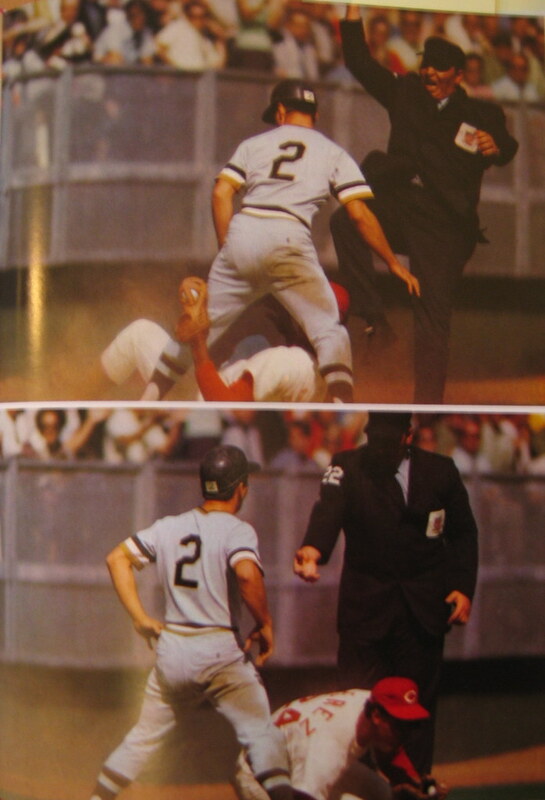 Roberto Clemente’s 21 should be retired before Ruth’s 3. Wasn’t Ruth numberless for most of his career anyway? 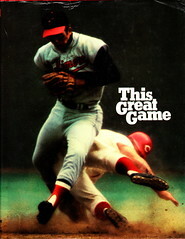 Who wrote the book “This Great Game?” I am having a hard time searching for it just by title. Love the ‘Baltimore’ jersey on the cover. Can’t wait for them to put it back on the road jerseys next year! Years ago when they were Boston’s AA affiliate, they were the New Britain Red Sox. As a matter of fact, the Sox have been bucking the same name trend. They used to be all Red Sox throughout the organization but now have the Portland Sea Dogs, the Lowell Spinners, the Greenville Drive, and the Landcaster Jethawks. The AAA team is technically the Pawtucket Red Sox, but they are commonly referred to as the Paw Sox. Even their “alternate” unis say Paw Sox on them and I put alternate in quotes because they wear them at home more often than not. I thought you had made a typo…adding an N but it didn’t make any sense! Different types of fantasy teams I guess! [quote comment=”273814″][quote comment=”273813″]In other news, Babe Ruth’s granddaughter wants Major League Baseball to retire Babe’s #3 throughout both leagues. Yes, but only becuase Clemente’s #21 shouldn’t be retired by anybody but the Pirates. Enough is enough. One can justify such a singular honor for Jackie Robinson, but that’s where it ought to end. And I don’t think either of them should. It’s unnecessary. Clemente has a statue and his Pirate jersey retired and the undying love of the city of Pittsburgh and admiration of baseball fans. There’s no need to take two more (attractive, no less) numbers out of circulation MLB-wide to honor either guy. They can’t be honored any more than they have been. It would be a hollow gesture. Yes, Clemente was a great player and a humanitarian. 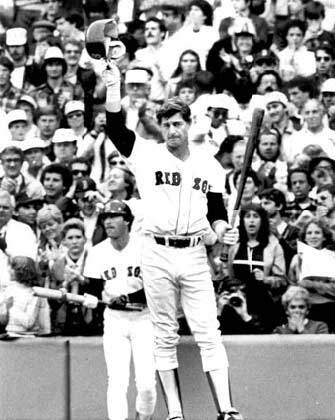 Ruth was the single biggest star probably ever and what he brought to the sport can’t be matched. That doesn’t mean we have to retire their numbers MLB-wide. And Ruth did only wear #3 for the Yankees from 1929 to 1934. From 1920-early 1929, they didn’t have numbers, right? The Packers put NOB on all Training Camp jerseys, including the red no-contact ones. [quote comment=”273816″][quote comment=”273813″]In other news, Babe Ruth’s granddaughter wants Major League Baseball to retire Babe’s #3 throughout both leagues. Babe wasn’t wearing #3 when he hit 60 HR 1927, right? Numbers came along in, what, ’31? So to honor Babe Ruth don’t put numbers on one of your sleeves. [quote comment=”273822″][quote comment=”273810″]This is interesting. Interesting. It looks like Favre’s might have the NFL Equipment bug on the front, but the Ravens’ jerseys look like you could wear them in a game, with sewn-on names and numbers and patches and everything. Beat me to it! Yeah the Pack has done that for years, but they don’t uuse the sleeve stripes and patches, so yeah, the Ravens are going the extra mile there. numbers for Yankees came along in ’29, I guess. Quick question that should be quikly answered…. Assuming that most NFL teams use their home and away colors to show offense and defense, and then red jerseys for the QB’s or other players they don’t want hit, kickers etc. What do the Chiefs use? Do all players wear white except the QB’s? And yes I looked around for pics myself but Flickr is blocked here, and that seems to be the only place anyone puts pics anymore. [quote comment=”273827″]Quick question that should be quikly answered…. Chiefs use gold, I think. Just the kind of quick thinking I knew I could count on. From the NHL.com front page link to The Hockey Show, there’s this pic of the “roster” shirts from the combine. [quote comment=”273804″][quote comment=”273801″][quote comment=”273798″]I’ve been lazy away from the computer for a day or two, but the Mariners wore their “Marineros” jerseys in honor of Latin American beisbol. The Twins have an affiliate in Beloit, WI and they are the Beloit Snappers because of the Native American tradition, and the local areas actually named “turtle”. I love local flavor as well. Wisconsin does such a nice job, having the Packers, Brewers (and formerly Braves), Bucks and Badgers (even though they were for miners and not the animal). Here, just do it yourself. I’ve always loved the Angels halo-hats. It seems just as second nature as the Rams’ horned helmets. I’ve just never understood why they didn’t stick around. 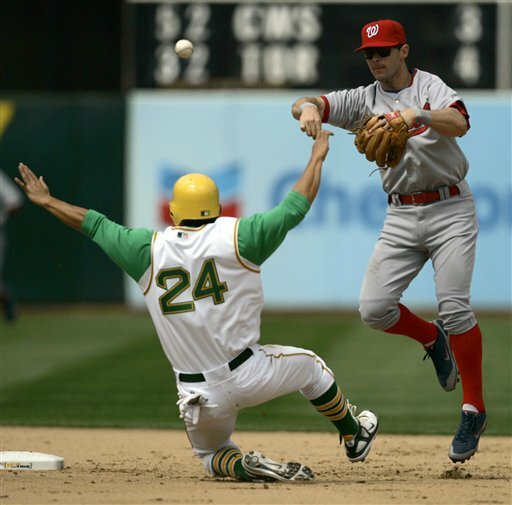 TODD RADOM, if you’re reading this, can you give any insight as to why this great chapter in Angels uni history is so short? Did you play with any halo-hats when you were working on their current designs? I’m not sure why there have been so many affiliate changes besides the move from AA to AAA. I think the last change from the Pirates to the Brewers had to do with the deterioration of Greer Stadium and the inability of the Sounds managment to get a new park built. Now, they’re in the same situation with Brewers after a proposed downtown ballpark was shot down last year. Gotta love the socks on these Atlanta Hawks dancers! …and that’s going to look awful. Think about how that’s going to look with the Rockies’ pinstripes, the Phillies’ thick piping, and the Cardinals’ plain grey pants, etc. It’s really not a big deal with the exception of the home run derby, but it’s still pretty disappointing. taha- any chance you can post the text of that email? That’s the fundamental problem with fan voting, the deserving players with the good stats get jobbed out by the “name” players who were once good, but aren’t doing all-star caliber work now. At least Hamilton looks like he’s getting the respect for his season so far. And as far as my earlier comment, I propose mandatory full-body RedMan suits for all spectators to ensure they can’t get hurt. 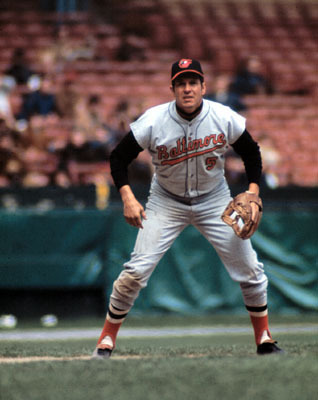 I am soooo hoping that orioles management do the right thing by the fans who have been wanting “Baltimore” to be placed back on the road jersey by allowing us to vote on 4 or 5 different versiona of the new jersey. the easy thing to do is to just copy this…..
Other than the Reading and GCL teams, the Phillies teams in their system – the Lehigh Valley Iron Pigs, the Clearwater Threshers, the Lakewood Blue Claws and the Williamsport Crosscutters – have creative names, and all save the GCL club were done or rebranded by Plan B Branding, including the hideous bubblegum trim and light blue road unis of the R-Phils. Bring back the railroad logo! In 1956 (I believe it was) Cincinnati fans stuffed the ballot boxes and a whole slew (5 to 7) Redlegs made the National League starting lineup. That’s when the voting was taken away from the fans for almost 20 years. Clemente has a statue and his Pirate jersey retired and the undying love of the city of Pittsburgh and admiration of baseball fans. Even the fence in right field of PNC Park is 21 feet tall in memory of Roberto. Which I think is one of the neatest commemorations in all of sports. I am watching the Phils/Reds game tonight, and in the top of the 2nd inning Joey Votto came up to bat with his fly open. Somebody please get a screencap of this. [quote comment=”273841″]Gotta love the socks on these Atlanta Hawks dancers! Verrrrrrrrrrrry nice……oh wait you mean the socks!? Yeah those are nice too. Forgive the ignorance, but is the A.L. jersey out yet? BLAH! I was thinking the same thing…What’s wrong with solid white home jerseys and solid navy road jerseys…and the mesh down the side DOESN’T have to be colored either SHEESH! Majestic SHEESH! I noticed that Leo Nunez has the words “EL CD” stitched into his glove. I know it’s not unusual for players to have their names sewn into their gloves but what is the significance of EL CD? — Jason D., Phoenix, Ariz.
OK, here’s the story we get. In the Dominican Republic, Nunez used to zip around on a motor bike. He was very proud of the bike and was always polishing it to a glimmering sheen. It sparkled — kind of like the shine on a compact disc. 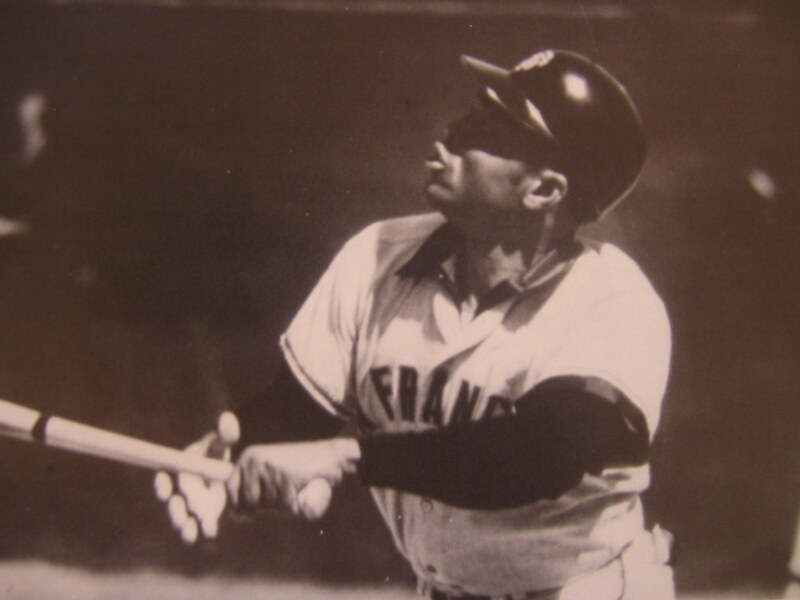 Not only that — Nunez was so skinny he sort of resembled a CD turned sideways. Anyway, his pals started calling him “El CD” or “the compact disc.” Get it? something not related to today’s posts, New Era has started (unfortunately)doing their “Cooperstown Collection” with raised embroidery AND putting the 3-D MLB logo on the back of the caps AND that New Era “flag” logo on the left side of the caps. 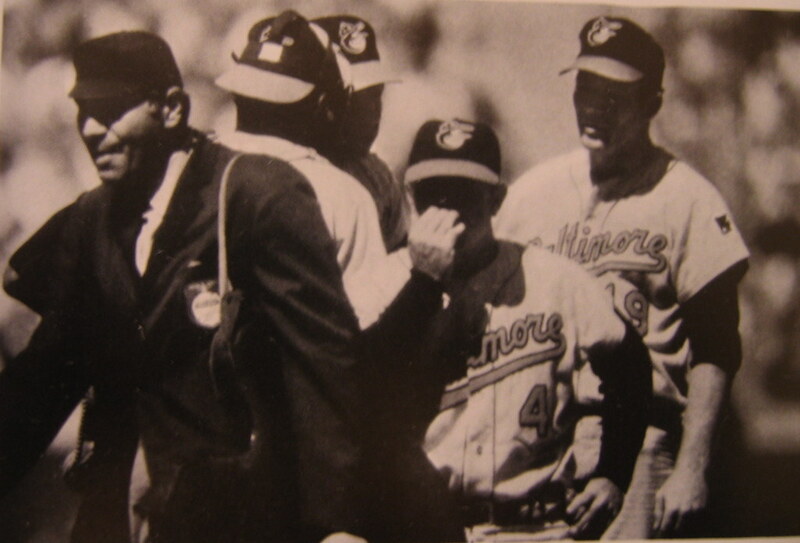 Some of the caps are 100% wool, but the teams that had white on their caps (Expos, Orioles) are the 70/30 poly mix. The ones that Mickeys Place in Coop are much better, must be a different series or something. Paul, when are you going to make it to D.C. ? I like the black BP jerseys (big surprise) and even the gray ones, but I don’t like the panels or the logo. So boring. [quote comment=”273852″][quote comment=”273841″]Gotta love the socks on these Atlanta Hawks dancers! Ooh, another incredibly intelligent comment. Thanks for contributing to our collective intellectual growth. [quote comment=”273860″][quote comment=”273852″][quote comment=”273841″]Gotta love the socks on these Atlanta Hawks dancers! at least he didn’t say what socks? I’ve has “This Great Game” since it came out, and have spent dozens of hours pouring over the unis…the dust jacket is ripped to shreds. 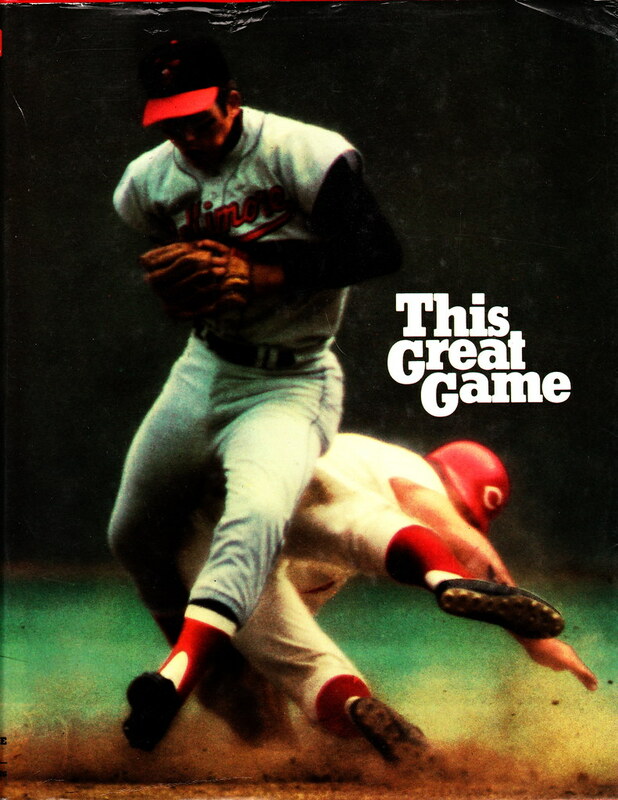 Even the cover is great: Davy Johnson’s short sleeves, classic cap, and striped stirrups, and Pete Rose’s astro-turf cleats. Lots of shorts of the Orioles vertically arched lettering, Joe Morgan in an original Astros shooting star uni. The Reds huge NOBs. I could go on and on. I noted a few weeks ago that Francoeur broke out the stirrups…tonight it’s solid navy hose. I like the Braves all-navy cap with the all gray road uni…they’re 1 – 1 in those! A similar Book Club selection would be “The First 50 Years” about the NFL…great uni stuff, including a section on the evolution of the uniform. how come all the ASU fans keep flashing the shocker? I thought that was the Matt Hardy Version 1.0 symbol! [quote comment=”273820″][quote comment=”273814″][quote comment=”273813″]In other news, Babe Ruth’s granddaughter wants Major League Baseball to retire Babe’s #3 throughout both leagues. 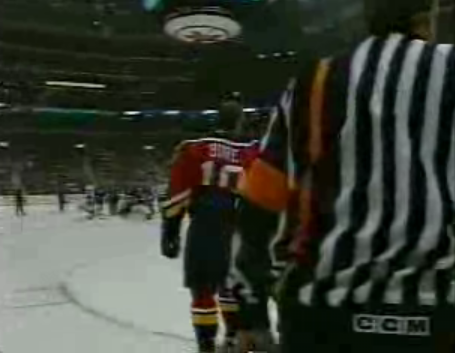 Anyone else remember when the Penguins wore yellow helmets? I think it’s Northwestern, and I was just saying they did play Indiana in Evanston in ’59. But it could be non-conference game during that time period. Haven’t been able to scrounge up their schedules from those years to see if anyone looks like a likely possible opponent for that photo. Regarding All-Star BP jerseys…aren’t they based on the colors of the team hosting the game? That would explain the Navy and Gray. Probably believed, and should have, that white shirts would have looked kinda “softball” with most teams road pants (most of them gray). On the subject of minor league team names: before merchandising became such a big and valuable deal, it was cheaper and easier to send old major league uniforms down through the system. If the nickname was the same, the wordmark didn’t have to change. Regarding the stripes between the mound and the plate at the Polo Grounds – I think that’s an early Adiddas marketing idea. Probably coming soon to a new Yankees ballpark near you. 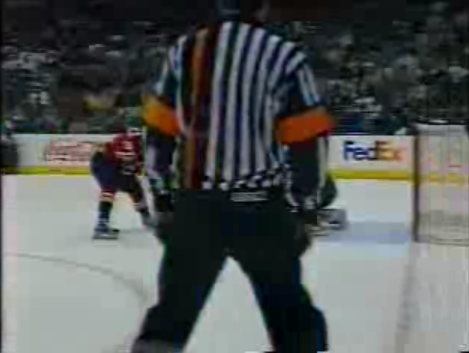 NHL ref Dan O’Halloran wears No. 13 as a reminder of how he almost died from a gunshot wound. those boots Ronaldo is wearing aren’t a carbon fiber print, they are literally carbon fiber. They are a vapor concept boot made from carbon fiber and thats why there is no cover on the laces either. because a carbon fiber cover wasn’t in the cards. Normally the new vapors have a carbon fiber base, but those are all carbon fiber….